As they screamed down the mountain at 80kmph, Vino had fire in his soul and was in no mood to ride into Granada alongside Valverde. Astoundingly he attacks again and goes off after Danielson like a madman. With 12km to go Vino is 31 seconds behind Danielson and 13 seconds ahead of Valverde. At 9km to go the gaps are 17 seconds and 45 seconds. Vino caught Danielson with 5km to go and the Valverde group was now 44 seconds back (at this point Vino needed about another minute to rob Valverde of his leader's jersey). American Tom Danielson and Vino quickly formed an alliance and together they set about turning the race on its head. The two fugitives, in full flight, were now heading for home as desperation drove the chasers behind them. This was bike racing at its best. Into the final kilometer Vino hammered like a man possessed in order to squeeze every possible second out of Valverde. Taking a fantastic win, Danielson won the sprint and Vinokourov claimed the Gold Jersey of race leadership. From his attack near the top of the Monachil to the finish line 23 km later, Vinokourov took 1'38” out of Valverde, who he now leads by 9 seconds on GC. Having ascended the final major climb of the day the leading riders had assumed that the plunge down to Granada would be no more than a high speed formality. As they learnt to their cost, if Vino is with you assume nothing. As we now know Vinokourov went on to Madrid and in fact extended his advantage on the disillusioned Vavlerde to claim his first Grand Tour victory. Most observers, although greatly respecting Vinokourov, view him as a rider capable of brilliant rides but lacking in the self discipline required to contain his natural aggression. On so many occasions he had ridden his heart out and left everything on the road to be beaten in the end by perhaps less talented riders. The 2006 Vuelta showed that he was now capable of harnessing his talent and, probably much against his own natural instincts, preserve his energy for strategically and tactically important moments. In terms of comparisons Vinokourov evokes memories of Claudio Chiapucci (il Diablo – the devil) and his often reckless attacking style. Within the current peloton Vino belongs to the same exclusive class as Paolo Bettini. Both riders seem to be on form for most of the season and when near the front of important races both are considered prime candidates for victory. It is probably fair to say that Bettini will never win a Grand Tour but most times he will have a very slight edge over Vino in the one day classics. For stage races Vino has the greater ability to infiltrate and maintain his position near or at the head of the GC race. What is given is that with either of these men the races that they are in will not be boring. A look at Vinokourov's palmares reveals a true all-rounder with tremendous results in both one day races as well as stage races. From the classics he has won the Amstel Gold (2003) and the Liege-Bastogne-Liege (2005). Stage race victories include the Tour of Germany (2001), Paris-Nice (2003) and the Vuelta a Espana (2006). In addition has numerous prestigious stage wins and podium places in the World Championships and summer Olympics. Born on 16 September 1973 in Petropavl close to the Russian border in northern Kazakhstan , Vinokourov is a Kazakhstani (ethnic Russian). Kazakhstan is a fascinating country which by land mass is the ninth largest country in the world. With a history that goes back to stone age times, Kazakhstan is dominated by the vast ‘ steppe ' region (the largest in the world) and semi-desert lands. Until the 19 th Century the population comprised mostly warlike nomadic tribes. Recent discoveries indicate that an ancient nation ruled by female warriors (the Amazons) once roamed the region. In the 16 th Century a common language, culture and economy had evolved. 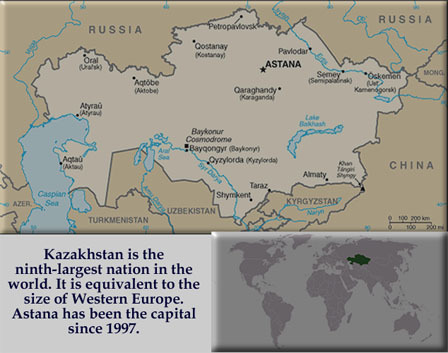 Over the centuries various empires have ruled all or part of Kazakhstan much against the will of the Kazachs. The Persian Empire, the Mongol Empire, Arabs and finally Russia have all imposed their will on the country. Passing through the region is the fabled “ Silk Road ” to China as well as the trans-Siberian railway. Today modern Kazakhstan is a constitutional republic and like so many of the former Soviet Union 's satellite states struggled through the 1980's to escape from communist rule. As so often over the centuries, Kazakhstan experienced bitter struggles and much bloodshed before the country was able to declare independence in December 1991. Unfortunately the Kazakh style of democracy is still struggling with the deeply ingrained Soviet system. The President, Nursaltan Nazarbayev, manipulated parliament to pass a law granting him lifetime powers and privileges (basically to be President for life). However since 2000 the country itself has made great progress to develop a market economy driven largely through its immense oil, gas and mineral reserves. In looking at Vinokourov it is easy to see how instrumental his country is in forming Vino the professional cyclist. His aggressive and fearless attacking nature surely has its genetic roots in his warlike nomadic forbears. As a child his natural athletic capabilities were obviously recognized and he was thus sucked into the Soviet style sports system which taught him “the basic fundamentals and included lot's of running during the winter”. Eventually the system channeled him into the Kazakhstan national cycling academy. From there he went to France for brief stint as an amateur where his abilities were soon recognized and then rewarded with his first pro contract (with Casino in 1998). Boxing, hockey and gymnastics are all popular sports in Kazakhstan with excellent results being achieved on the international stage. However cycling, and in particular Vinokourov, is possibly the most popular sport. In fact Vino is a national hero who enjoys close relationships with leading politicians and business people. This has manifested itself in the sponsorship scenario with a consortium of Kazakh businesses underwriting the creation of the Astana Team. It is thus through the character of Vinokourov that the international world of cycling is now learning about his home country which he supports with immense pride. The unmistakable turquoise and yellow colors of the Astana Team reflect the national colors of Kazakhstan . Astana itself is not, like most cycle team sponsors, a company but rather the country's capital city. Located in central Kazakhstan , this city of 600,000 people only became the capital in 1997. It sits on the banks of the Ishim River in the very flat, semi-desert steppe region. The raw, almost treeless landscape gives Astana the dubious reputation of being one of the coldest capitals in the world and in fact most years is frozen for six months of the year. The political and economic engine, driven largely by oil money, is fuelling a huge building boom designed to make Astana the largest and most important city in Central Asia . Sponsoring the Astana Team is one way that the city is working to develop international visibility for itself. Like so much in cycling in 2006, Vinokourov and the Astana team were not untouched by the ‘ Operacion Puerto '. Rising from the ashes of the former Liberty team, Vinokourov along with some former Liberty teammates, could be described as collateral damage by the far reaching drug scandal. On one side Astana stepped in to provide the funds to create a new team from the shocked remnants of the disbanded Liberty organization. Unfortunately anyone named by the Operacion Puerto investigators were barred from Pro Tour races. Vino and three of his teammates had no links whatsoever with the scandal but with just four riders it was impossible for Astana to participate in the 2006 Tour de France. Losing a chance at Tour victory in 2006 was a bitter blow to Vino and his Vuelta victory was his way to both compensate for that loss as well as to prove his credentials as a Grand Tour winner. For 2007 Vinokourov is only thinking Tour de France but again he is at the mercy of UCI ruling. The former (disgraced) director of the Liberty team, Manalo Saiz, is a central figure in the Operacion Puerto investigation. Since his downfall he steadfastly maintained ownership of ‘ Active Bay ' which owned Vino's team. This potentially catastrophic link was finally severed late December 2006 when the UCI refused to renew Saiz's Pro Tour license. Although the contractual arrangements between Saiz and any pro riders may still hold a few barbs it now seems that Vino and his Astana teammates are free from Saiz. After a ‘technicality' (not related to Saiz) that looked as though the Astana team would not be awarded Pro Tour team status, all turned out well for the team when the UCI finally accepted their application at the end of 2006. The 2007 Astana Pro Tour squad is already set up with a formidable array of talent including Paolo Savoldelli, Andrej Kashechkin and Andreas Kloeden. Race fans will be hoping to see Vino ignite fireworks in July to help produce a memorable and most hopefully scandal free Tour de France.